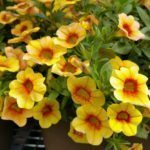 Can Calibrachoa grow in the same container as a rosebush? Yes, but realize that it will compete for water and nutrients with the rose. 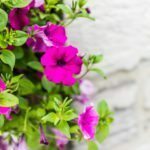 I suggest planting them in the front of the container so the calibrachoa spills instead of climbing into the rose. If the rose is already snug in its container, it may be wise to pot it into a larger one so you don't have to disrupt rose roots when you put in the annual. When you remove the Calibrachoa, hold its place with a 3 inch potting cell, This will make it easier to plant next spring.